Little is known about Leonardo’s early life. He spent his first five years in the hamlet of Anchiano, then lived in the household of his father, grandparents and uncle, Francesco, in the small town of Vinci. His father had married a sixteen-year-old girl named Albiera, who loved Leonardo but died young. In later life, Leonardo only recorded two childhood incidents. One, which he regarded as an omen, was when a kite dropped from the sky and hovered over his cradle, its tail feathers brushing his face. The second occurred while exploring in the mountains. He discovered a cave and was both terrified that some great monster might lurk there, and driven by curiosity to find out what was inside. Leonardo’s early life has been the subject of historical conjecture. Vasari, the 16th century biographer of Renaissance painters tells of how a local peasant requested that Ser Piero ask his talented son to paint a picture on a round plaque. Leonardo responded with a painting of snakes spitting fire which was so terrifying that Ser Piero sold it to a Florentine art dealer, who sold it to the Duke of Milan. Meanwhile, having made a profit, Ser Piero bought a plaque decorated with a heart pierced by an arrow, which he gave to the peasant. In 1466, at the age of fourteen, Leonardo was apprenticed to one of the most successful artists of his day, Andrea di Cione, known as Verrocchio. Verrocchio’s workshop was at the centre of the intellectual currents of Florence, assuring the young Leonardo of an education in the humanities. Other famous painters apprenticed or associated with the workshop include Ghirlandaio, Perugino, Botticelli, and Lorenzo di Credi. 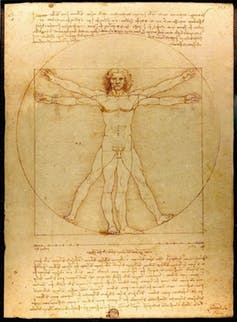 Leonardo would have been exposed to a vast range of technical skills and had the opportunity to learn drafting, chemistry, metallurgy, metal working, plaster casting, leather working, mechanics and carpentry as well as the artistic skills of drawing, painting, sculpting and modeling. Much of the painted production of Verrocchio’s workshop was done by his employees. According to Vasari, Leonardo collaborated with Verrocchio on his Baptism of Christ, painting the young angel holding Jesus’ robe in a manner that was so far superior to his master’s that Verrocchio put down his brush and never painted again. This is probably an exaggeration. 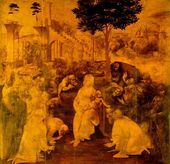 On close examination, the painting reveals much that has been painted or touched up over the tempera using the new technique of oil paint, the landscape, the rocks that can be seen through the brown mountain stream and much of the figure of Jesus bearing witness to the hand of Leonardo. By 1472, at the age of twenty, Leonardo qualified as a master in the Guild of St Luke, the guild of artists and doctors of medicine, but even after his father set him up in his own workshop, his attachment to Verrocchio was such that he continued to collaborate with him. Leonardo’s earliest known dated work is a drawing in pen and ink of the Arno valley, drawn on 5 August 1473. In 1482 Leonardo helped secure peace between Lorenzo de’ Medici and Ludovico il Moro, Duke of Milan. Leonardo wrote a letter to Ludovico, describing his engineering and painting skill. He created a silver lyre in the shape of a horse’s head, with which he was sent to Milan. His work for Ludovico included floats and pageants for special occasions, designs for a dome for Milan Cathedral and a model for a huge equestrian monument to Francesco Sforza, Ludovico’s predecessor. Leonardo modelled a huge horse in clay, which became known as the “Gran Cavallo”, and surpassed in size the two large equestrian statues of the Renaissance. Seventy tons of bronze were set aside for casting it. The monument remained unfinished for several years, which was not unusual for Leonardo. In 1492 the model was completed, and Leonardo was making detailed plans for its casting. Michelangelo rudely implied that Leonardo was unable to cast it. In November 1494 Ludovico gave the bronze to be used for cannons to defend the city from invasion by Charles VIII. At the start of the Second Italian War in 1499, the invading French troops used the life-size clay model for the “Gran Cavallo” for target practice. With Ludovico Sforza overthrown, Leonardo, with his assistant Salai and friend, the mathematician Luca Pacioli, fled Milan for Venice, where he was employed as a military architect and engineer, devising methods to defend the city from naval attack. On his return to Florence in 1500, he and his household were guests of the Servite monks at the monastery of Santissima Annunziata and were provided with a workshop where, according to Vasari, Leonardo created the cartoon of The Virgin and Child with St. Anne and St. John the Baptist, a work that won such admiration that “men and women, young and old” flocked to see it “as if they were attending a great festival”. In 1502 Leonardo entered the service of Cesare Borgia, the son of Pope Alexander VI, acting as a military architect and engineer and travelling throughout Italy with his patron. He returned to Florence where he rejoined the Guild of St Luke on 18 October 1503, and spent two years designing and painting a great mural of The Battle of Anghiari for the Signoria, with Michelangelo designing its companion piece, The Battle of Cascina. In Florence in 1504, he was part of a committee formed to relocate, against the artist’s will, Michelangelo’s statue of David. In 1506 he returned to Milan. 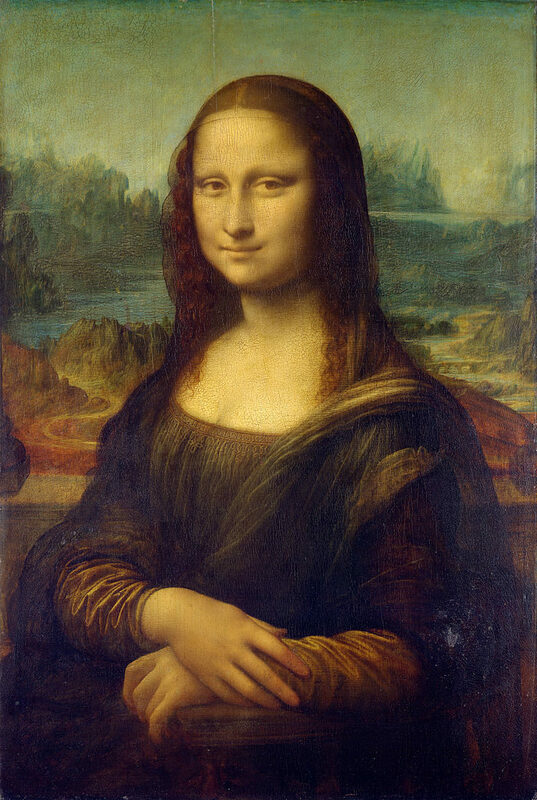 Many of Leonardo’s most prominent pupils or followers in painting either knew or worked with him in Milan, including Bernardino Luini, Giovanni Antonio Boltraffio and Marco D’Oggione. However, he did not stay in Milan for long because his father had died in 1504, and in 1507 he was back in Florence trying to sort out problems with his brothers over his father’s estate. By 1508 he was back in Milan, living in his own house in Porta Orientale in the parish of Santa Babila. From September 1513 to 1516, Leonardo spent much of his time living in the Belvedere in the Vatican in Rome, where Raphael and Michelangelo were both active at the time. In October 1515, François I of France recaptured Milan. On 19th December, Leonardo was present at the meeting of Francois I and Pope Leo X, which took place in Bologna. It was for Francois that Leonardo was commissioned to make a mechanical lion which could walk forward, then open its chest to reveal a cluster of lilies. In 1516, he entered François’ service, being given the use of the manor house Clos Lucé near the king’s residence at the royal Chateau Amboise. It was here that he spent the last three years of his life, accompanied by his friend and apprentice, Count Francesco Melzi, supported by a pension totalling 10,000 scudi. Leonardo died at Clos Lucé, France, on May 2, 1519. François I had become a close friend. Vasari records that the King held Leonardo’s head in his arms as he died, although this story, beloved by the French and portrayed in romantic paintings by Ingres, Ménageot and other French artists, may be legend rather than fact. Vasari also tells us that in his last days, Leonardo sent for a priest to make his confession and to receive the Holy Sacrament. In accordance to his will, sixty beggars followed his casket. He was buried in the Chapel of Saint-Hubert in the castle of Amboise. Melzi was the principal heir and executor, receiving as well as money, Leonardo’s paintings, tools, library and personal effects. Leonardo also remembered his other long-time pupil and companion, Salai and his servant Battista di Vilussis, who each received half of Leonardo’s vineyards, his brothers who received land, and his serving woman who received a black cloak of good stuff with a fur edge.